If you are looking for a recipe that is packed full of lemon flavor and delicious feta cheese, this lemon orzo salad with feta is the one that you’ve been searching for. It’s full of ingredients that all will enjoy and packed with herbs and freshness that will have everyone asking for seconds…and maybe even thirds! 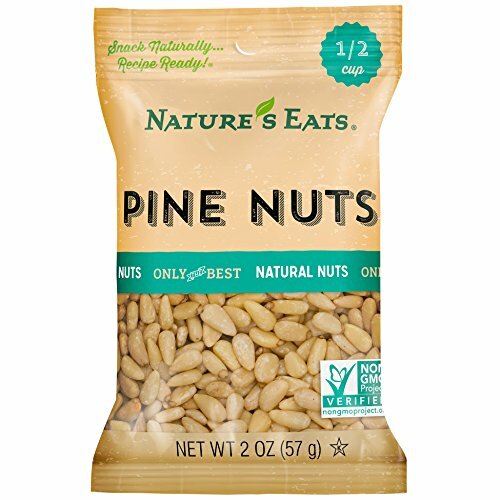 Nature’s Eats Pine Nuts, 2 Ounce This a hit not only in my house, but it’s also a hit when taken to other gatherings outside the home. School functions, family dinners, gatherings over at a friends house…all great places to showcase this recipe for others to enjoy. And did I mention the feta cheese?! Who doesn’t love feta cheese? The flavor really takes it over the edge and into a whole other dimension, in my opinion. My taste buds seriously love this recipe and I find that I’m often craving the combination of the herbs and ingredients quite often. So often, that making this dish on a weekly basis isn’t out the question. It’s a good alternative to other heavily processed food items to try to serve my family, and it’s light enough that it doesn’t seem to weigh me down when eating it for dinner. If you are looking for a seriously light and delicious meal that is certain to bring a smile to your face, then why not give this dish a try? Once you take your very first bite, you’ll be happy that you did! 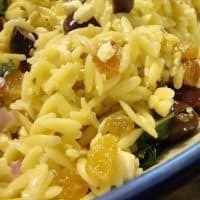 This lemon orzo salad with feta is packed full of lemon flavor and delicious feta cheese, something that everyone will enjoy. Mix the olive oil, lemon juice, garlic, oregano, salt, pepper, and sugar in a small bowl and set aside. Cook the pasta according to package directions. Drain and spread out on a baking sheet to allow it to cool more quickly. I drizzle a little bit of olive oil on it at this stage to keep it moist and prevent it from sticking. After it has cooled for about 10 minutes or so, move to a large bowl and toss the pasta with the dressing. Toast the pine nuts by putting them in a small skillet over medium-low heat and cooking for about 5 minutes. Add the pine nuts, raisins, olives, red onion, and basil and stir to combine. Add the feta and mix. Cover and refrigerate. Bring back to room temperature before serving.